Argo Tea proudly sources the best ingredients from around the world, including handpicked, loose-leaf teas. The caffeine levels range from high to caffeine-free depending on the intended health benefit of the tea, and each blend is made with real pieces of fruit, flowers, and other all-natural ingredients. Studies show that these all-natural ingredients play a large role in the health benefits offered in each tea. Green tea has been shown to improve blood flow and lower cholesterol, which makes up the core base of Detox. Yerba mate provides an energy boost with no “crash” and chamomile has been used for centuries to treat chest colds and upset stomachs – both found in the Energize and Relax teas. 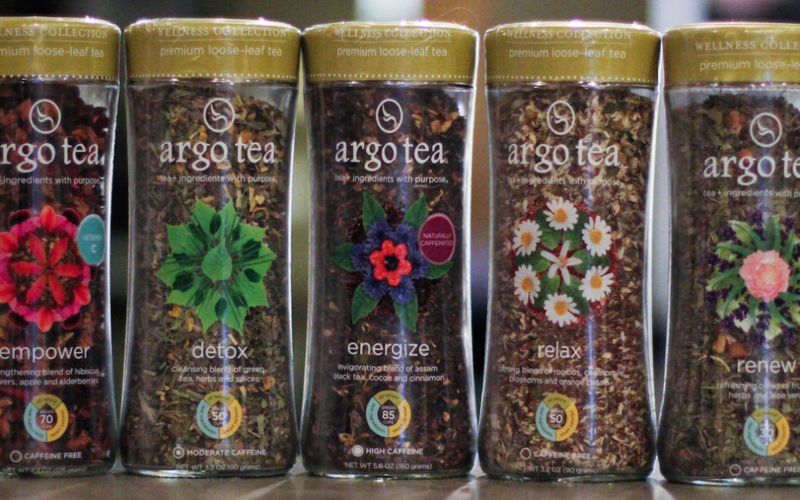 The Wellness Collection is now available online at www.argotea.com and in Argo Tea cafés. The retail price for each loose-leaf bottle is $15.95, ranging in net weight based on each blend: Energize (5.6 oz., brews 85 cups), Detox (3.2 oz., brews 50 cups), Empower (4.4 oz., brews 70 cups), Renew (2.1 oz., brews 30 cups) and Relax (3.2 oz., brews 50 cups). The Wellness Collection is also featured in a line of new signature drinks available at Argo Tea cafes nationwide. These limited time specials pair wellness teas with innovative functional ingredients like Säpp Birch Water, tapped from birch trees in the mountains of eastern Europe. These limited time specials are available through March 20, 2017, at participating Argo Tea cafés. Since brewing its first cup of tea in 2003, Argo Tea has quickly become a household name and leading multi-channel, branded beverage company. Its ready-to-drink teas in Argo Tea’s iconic bottles are now available in over 40,000 outlets nationwide through partnerships with premier retailers that value its brand-defining commitment to quality, sustainability and healthy living. With nearly 50 Argo Tea cafés globally, it has established a brand building marketing platform that serves over 10 million cups of tea annually fueling its innovation. Argo Tea’s menu includes all natural-tea based signature drinks, over thirty varieties of loose-leaf teas, premium coffee, fresh-baked pastries, specialty foods, and a selection of tea ware and accessories. Bsc, Kris Gunners. “10 Proven Benefits of Green Tea.” Authority Nutrition. Authority Nutrition, 18 Aug. 2016. Web. 21 Nov. 2016. MS, RD, Alina Peter. “8 Health Benefits of Yerba Mate (Backed by Science).” Authority Nutrition. Authority Nutrition, 07 Nov. 2016. Web. 21 Nov. 2016.